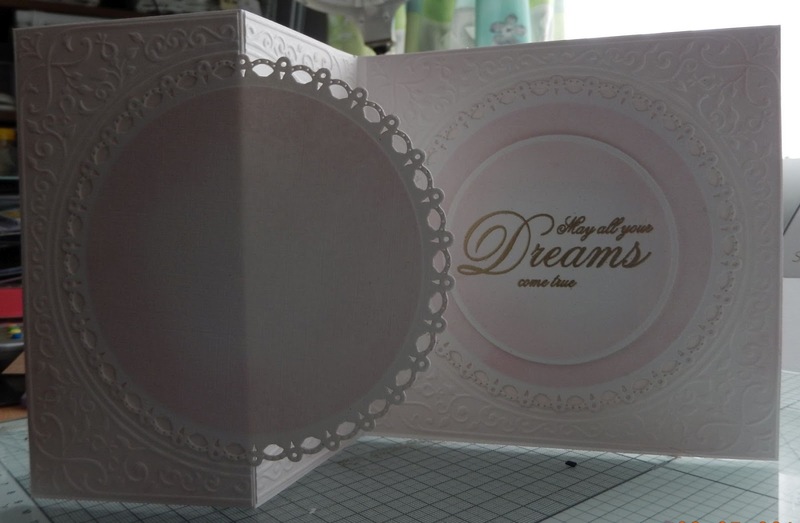 This really was a card that started off as one thing and ended up totally differently.... I bought myself a craft magazine with an embossing folder as a freebie, when I tried it out I was quite pleased with it and before long I had made a plain cardblank which I put away in my stash. That reminds me later this month our cherry tree will blossom it looks so pretty, bare branches heavy with beautiful delicate pink flowers and then you can guarantee the wind will come and blow them all off the tree and the lawn will be a carpet of beautiful pink flowers. Beautiful card Annie!! 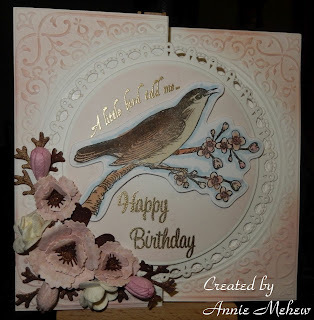 I love your bird and gorgeous flowers you have created, and the EB folder is beautiful as well! Our Red Bud Trees and Dogwoods are in full bloom right now, so pretty and so amazing with all the rain, hail and wind the blossoms are still on! Have a great weekend! Sometimes Annie you just have to let your crafty heart lead you and in the end you have a most beautiful creation!! 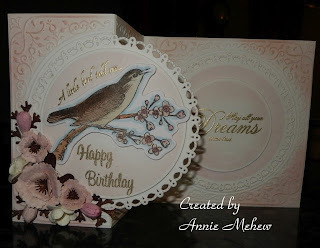 Well your crafty heart certainly lead you in the right direction...this is so very elegant and beautiful Annie!! Wishing you a most wonderful weekend Annie! Hi Annie! Your card is absolutely stunning!!! I love all of your gorgeous work! Your cherry blossoms came out beautiful!! How special that you have a cherry tree in your yard! I always admire the pretty cherry blossom trees that I see in people's yard and I think the carpet of pink flowers around the tree is so pretty! I hope that your having a great week!